The 2010 World Fencing Championships were held at the Grand Palais in Paris from 4 to 13 November. It was the fourth time that the City of Paris was hosting the World Championships. A record number of 950 athletes from 110 countries took part in this competition. 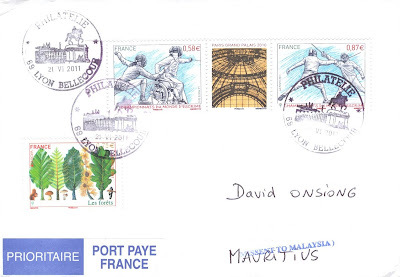 La Poste issued on October 25, 2010 a set of 2 gutter pairs stamps to mark this event. The 0, 58€ stamp (left) portrays a disabled athlete in a wheelchair while the 0,87€ stamp illustrates two bodied athletes fighting. The impressive glass vault of the Grand Palais is illustrated on the gutter. The postage was completed with the 0,75€ Europa stamp issued by France, the Europa theme this year being the International Year of Forestry. Note that this cover was missent to Malaysia.